X Factor and Dancing on Ice star Ray Quinn is playing Billy Kostecki in Dirty Dancing in London’s West End until the show closes in July. Later in the year he is due to play the lead role of Danny Zuko in Grease (he played both Doody and Danny in the West End). 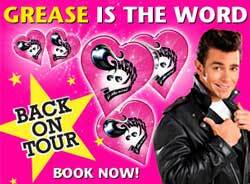 He is to star in the tour of Grease when it reaches his home town of Liverpool and plays at the Empire from 8th-19th November 2011.